Mobile learning (m-learning) is a natural extension of electronic learning (e-learning) and has the potential to make learning even more widely available and accessible than we are used to in existing e-learning environments. The role that communication and interaction plays in the learning process is a critical success factor. It is within this context that m-learning can contribute to the quality of education. It offers opportunities the optimization of interaction between lecturers and learners, among learners, and among members of communities of practice (COPs). Wireless and mobile technologies also make it possible to provide learning opportunities to learners that are either without infrastructure for access (example rural learners) or continually on the move (example business professionals). This article shares the latest developments regarding a m-learning project in Africa and proposes a model for the implementation of m-learning in higher education in developing countries. Brown, T.H. (2005). Towards a model for m-learning in Africa. 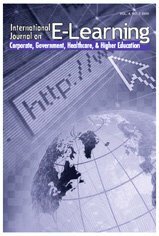 International Journal on E-Learning, 4 (3), 299-315. Norfolk, VA: Association for the Advancement of Computing in Education (AACE). Retrieved April 22, 2019 from https://www.learntechlib.org/primary/p/5082/. Abernathy, D. (2001). Get ready for m-learning. Learning Circuits. American Association for Training and Development, Alexandria, Virginia, USA. Bates, P.J. (2002). Making e-learning mobile – a brief overview of developments in m-learning. Paper delivered at the 2002 Online Education Conference, November 2002, Berlin, Germany. Brown, J.S. (1999). Learning, working & Playing in the digital age. Paper delivered at the 1999 Conference on Higher Education of the American Association for Higher Education, March 1999, Washington, USA. Kristiansen, T. (2001). M-learning: Experiences from the use of WAP as a supplement in learning. Unpublished report on a pilot project in co-operation between Insite, Ericsson, Telenor Mobil and It Fornebu Knowation. April 2001, Norway. Nyiri, K. (2002). Towards a philosophy of m-learning. Paper delivered at the IEEE International Workshop on Wireless and Mobile Technologies in Education. August 29-30, 2002, Växjö University, Sweden. Saville-Smith, C., & Kent, P. (2003). The use of palmtop computers for learning: A review of the literature. Research report published by the Learning and Skills Development Agency, London, UK. Retrieved April 14, 2005, from http://www.LSDA.org.uk Shapshak, D.
Listening to an Educational Podcast While Driving a Car: Can Students Really Multitask?